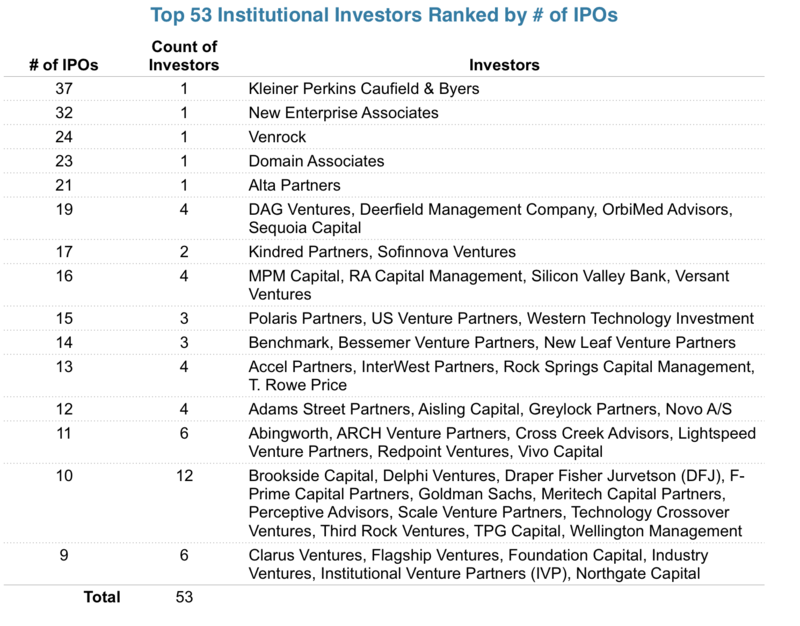 Which Investors Have The Most Acquisitions And IPOs In Their Portfolios? 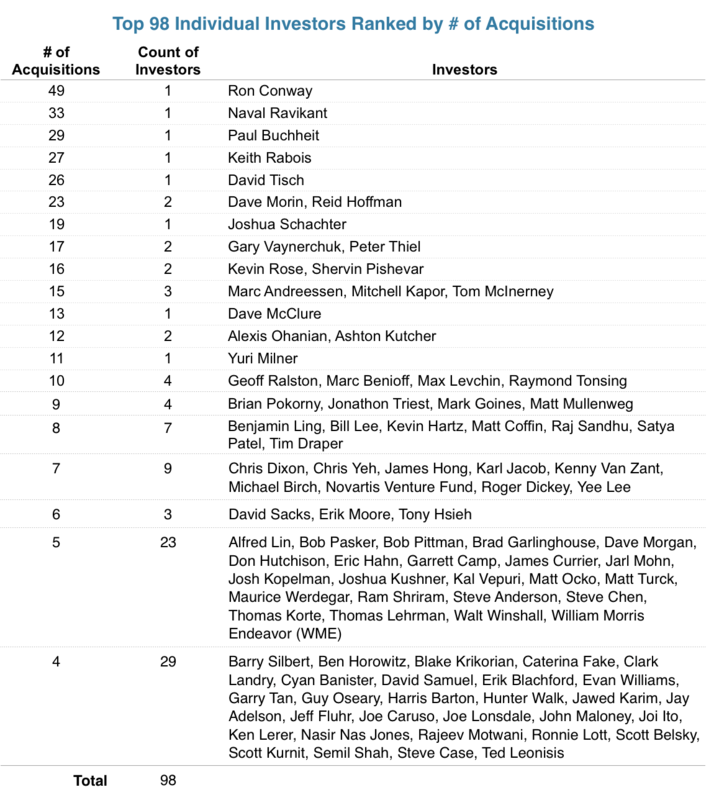 tl;dr: Here are the investors with the deepest bench of successful exits, and it contains most of the usual suspects. Mergers, acquisitions and initial public offerings are the primary ways that venture capitalists and angel investors realize returns on their investments. So it’s no wonder startup investors tend to get excited when talking about their exited companies. It’s a signal to entrepreneurs that they have a great track record of helping early shareholders cash out. But which investors have the most exits? To answer this question, we analyzed a list of 5,098 institutional and individual investors in 4,818 companies that have raised money, are based in the United States, and have either been acquired or gone public. We then cut the main list and ranked the top 50-ish investors by the type of exit event. Of course, institutions aren’t the only investors in startups; individuals invest as well. 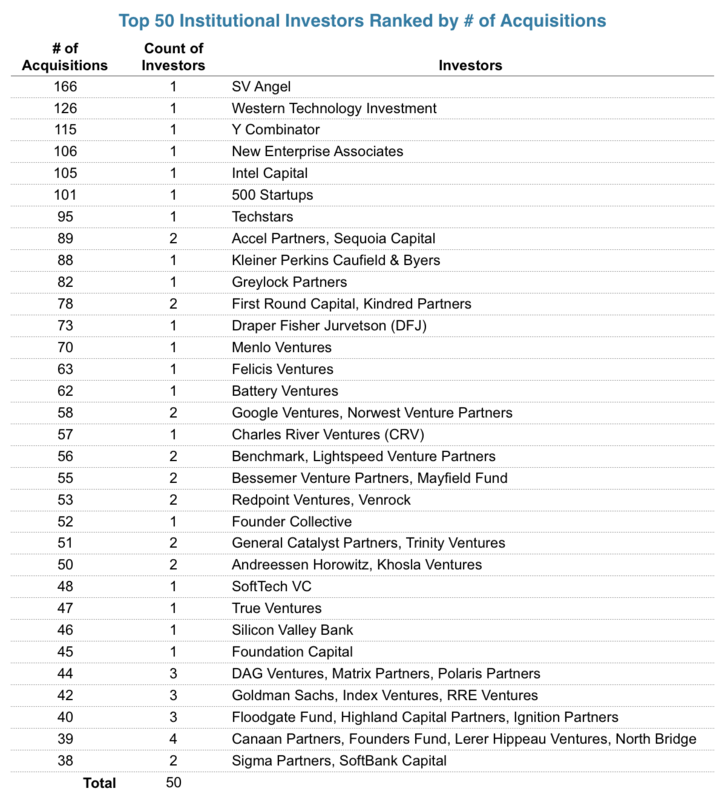 We created a list of the top 98 individual investors ranked by the number of acquisitions in their portfolios. For the record, we didn’t include family offices, family foundations, or single-client investment firms (e.g. Vulcan Capital, Winklevoss Capital, and Bezos Expeditions). PayPal cofounder, Facebook’s first investor and political gadfly Peter Thiel. IRL Iron Man himself, Elon Musk, a fellow member of the PayPal Mafia. A handful of individuals made startup investments into two public companies: Ashton Kutcher, Chris Sacca, David Sacks, Gary Vaynerchuk, Jeff Fluhr, Paul Buchheit, and Reid Hoffman. After that, it’s a long laundry list of one-off victories. This shouldn’t come as a surprise, though. Just like in an investor’s venture portfolio, success as measured by exits follows a power law distribution. Less than 10% of the 5,098 individual and institutional investors in our dataset have 40 or more acquired or IPO’d companies in their portfolios. So what to make of this? Well, comparing the lists from this piece to the lists from the previous one, we find something that is painfully obvious. In many ways, successful investors are successful because they’re successful. In other words, a good track record attracts better opportunities, and in the case of institutional startup investors, that just means they’re able to raise more money from their investors to continue that momentum. Otherwise, just like on the startup side of the table, it’s hard for new investors to break out from the pack.